The Amaranth Pink was quite possibly my favorite color from the selections. Darn it! Apparently this happens a lot. Well, good lesson to learn for future endeavors. Leathers production is kind of like department store makeup: cosmetic companies introduce you to something new and it seems to be quite popular, yet a year later, they take it off market for reasons utterly unbeknownst to the consumers who have already come to swear by those makeup products. 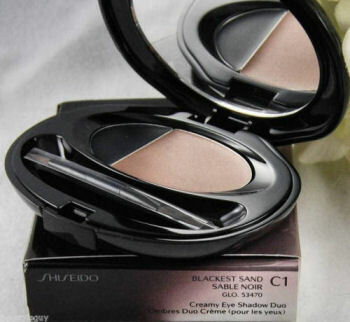 Like Shiseido’s Creamy Eye Shadow Duo in C1, Blackest Sand. Anyone remember that? Wow, that used to be one of my favorite products. Then one day I walked up to the Shisheido counter asking for this and the lady told me Shiseido no longer makes it. What the–!? Noo!! And that was the same reaction I had to finding out Amaranth Pink was no longer available. So I had to unload all my boxes of samples and prototypes and find alternative swatches. Hubby and I disputed this swatch. He likes the faux croc leather a lot. I dislike it for being faux croc. It’s like being a vegetarian and eating that fake meat stuff that’s made out of tofu. That’s what this material is. It’s a tofu burger seasoned to taste like beef. 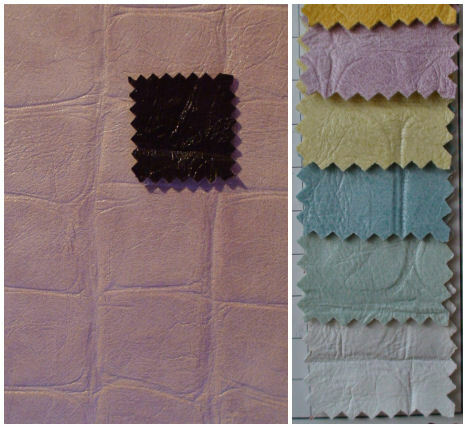 Faux croc is vegan and synthetic, but intentionally made to imitate the backside of a crocodile. What is up with that? Well. Hubby likes it, and he thinks it’s marketable. Guess we’ll see, because that’s what we ordered for all the Peripatetics and one Precisionist color option. Above are the swatch color combinations we picked out for the Peripatetic. It’s been tough, very tough to go through the painstaking process of choosing swatches and colors, struggle for months with samples making, confirm your swatches and colors for production, and then find out that the swatch color you chose, your favorite out of all of them no less, no longer exists. That then gets exacerbated further with a demanding, high-pressure day job. Day job work has consumed me this summer, which means I haven’t been able to put in the attention that this TZ venture requires. For instance, running due diligence for one of our deals had me up past 1 am yesterday. Forget TZ; I hardly have time for myself. Ah, but let’s end on a happy note… a kitty pic! This entry was posted in Business Development, Collection, Design Conception, Learning Curve, Musings, One Step Closer, Progress. Bookmark the permalink. 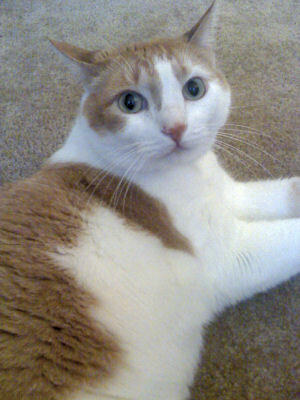 I love the very first bag in this post…and the adorable picture of your kitty!!! 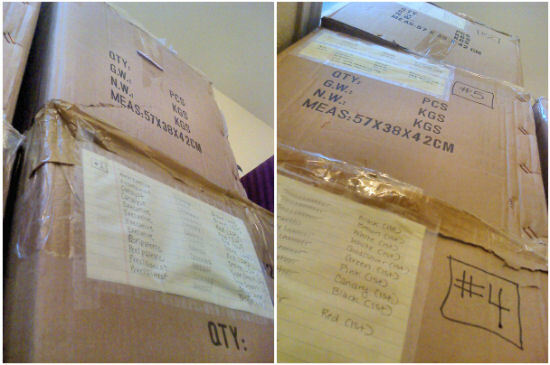 That is a lot of boxes!! Oh man the amaranth pink really is divine - such a bummer that it’s gone now! I’m not sure I like the faux croc. I can usually spot the difference, but do like your colors! Ugh, maybe it’s because I lust after what I can’t have, but I LOVE the amaranth pink – I can see why you’d be so devastated over not being able to have it! I love the colors of the faux croc, but I agree with your likening it to being like a vegetarian trying to convince yourself that soy bacon is a decent compromise/substitute (I actually laughed out loud at that comparison!). i haaate when that happens!! and its always the one that you want.. its like the swatches know and are out to get you.. well thats always how i feel. i hear ya on the faux croc.. but it does sell well! and reptilian is big this season! I still swear I want one of your sample bags. I love that coral-red-pink on the Workaholic… wish it didn’t run out! Of course whatever you want doesn’t end up being available. Of course. If you don’t need that sample, I’d be happy to take it off your hands. I’d pay for it, too! 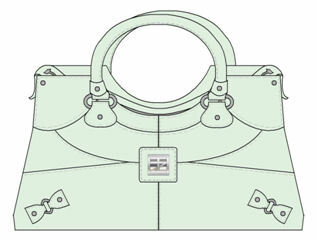 The Precisionist in mint foam green reminds me of a better looking Balenciaga tote. Which I love. It looks good in Faux Croc. I know what you’re saying, but veggies like me love our veggie meat that tastes like chicken. We eat it because it’s tasty and it’s good for you, and why the hell not? We get the best of both worlds. Faux croc is the same way. It’s better, and it looks good, and it’s cruelty free, so why the hell not? Plus the croc looks LOADS better than leather (no offense). It just does. With that extra sheen and texture, it adds a whole other level of style to the satchel that isn’t otherwise there with the matte texture of leather. I still want all of the colored samples of your Executive, and I don’t care if you don’t like them–they look great to me. 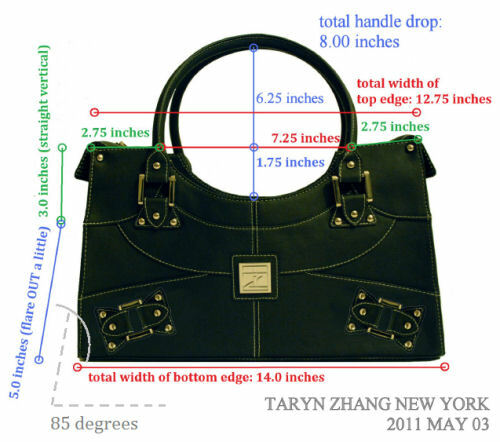 hey sunny.. i always love every bag you produced. especially o this post i like the chain one. 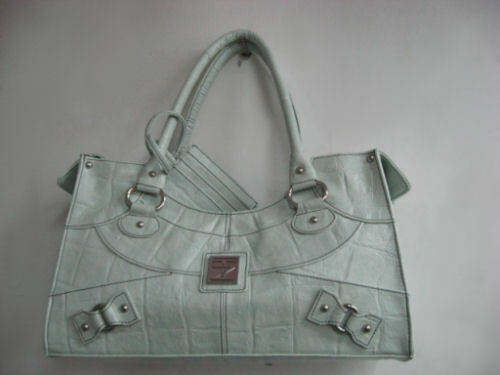 it’s gorgeous bag. and by the way i like your new hair cut on your previous post. you look amazing.. Sunny, I totally feel the same way about faux croc and fake meat stuff – hahaha! It’s so true! I’m so sorry they don’t carry your favorite swatch color too- I hate when they do that. It doesn’t make any sense to me when a best selling product just disappears into thin air. The bags look stunning, but I worry about your stamina. Please do try to find time just for you. Grab a cup of coffee at a cafe of your liking. Just take the time. Please dear. We are kindred spirits and this is important! 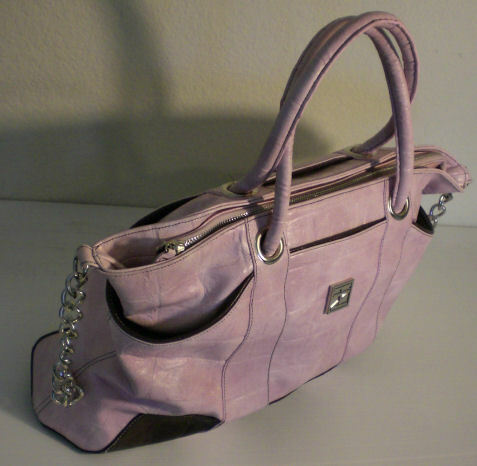 One day I’ll buy a bag from you and definitely post about it – wholeheartedly and from my own will! Thanks, Lar. 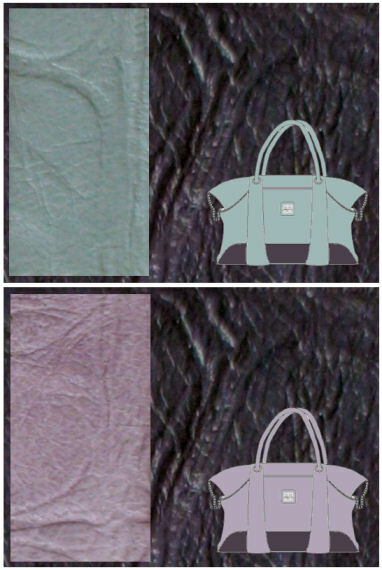 We actually ended up reducing the faux croc usage down to only 1 color for 1 bag, and didn’t order that many of them. We finally went with my opinion, which was that faux croc is not really the direction we want to go in. =) Thx! Thanks for your encouragement! Keep checking back for more updates on our design process. I’m so glad it’s helpful! OMG thank you for commiserating. It’s HORRIBLE. And frustrating. And yes, always the one you want the most that you can’t have. Sign. 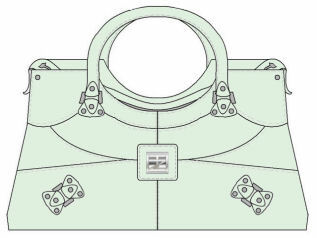 I’m glad this blog sheds light on the behind the scenes of handbags and accessories design! 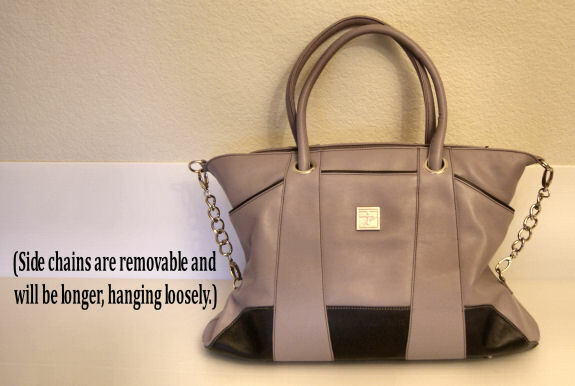 Yes, I can never look at a handbag hanging at a store the same ever again. 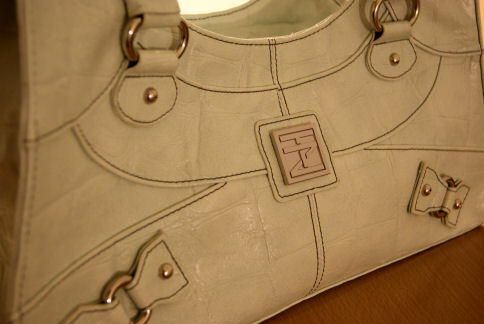 Now I see all the hard work, all the business decisions, all the thought and craftsmanship that go into each bag. It’s intriguing! Such a shame the color is no longer being produced. Love your designs though, so I’m sure whatever you go for will work. And yes, I hate it when favorite items or colors are discontinued. This happened to me so often with cosmetics and skincare. I’ll never understand… sigh. Your fears about leather and makeup colours being discontinued sound awfully similar to my fears that I won’t be able to find a certain lipstick or nail polish shade when I run out. But your leather colour situation is much more serious!